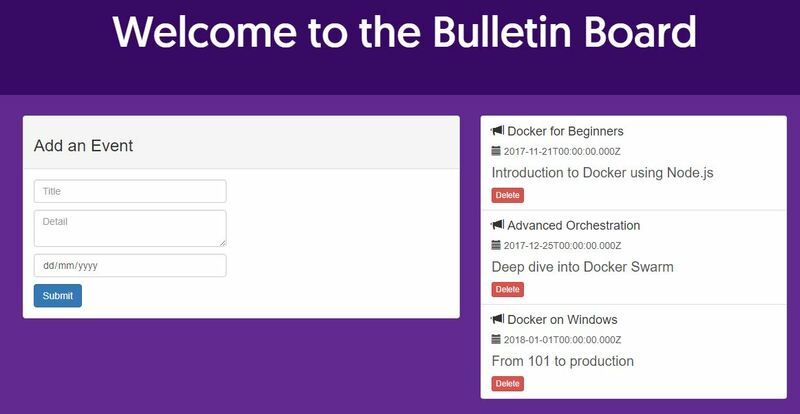 This lab walks through the evolution of a simple Node.js bulletin board application, running on Docker. You’ll start with a simple app that uses hard-coded data, then add SQL Server for persistent storage, and a proxy to improve web performance. You’ll learn about packaging applications in Docker images, running distributed applications across multiple containers, and adding instrumentation to your containers so you can see the health of your application. You’ll use the Docker command line, Docker Compose and Docker swarm for running the app. Use the following command to clone the application source code from GitHub (you can click the command or manually type it). This will make a copy of the lab’s repo in a new sub-directory called node-bulletin-board. You need a Docker ID to push your images to Docker Hub. If you don’t have one, create a free Docker ID at Docker Hub. Be sure to use your own Docker ID. Mine is sixeyed, so the command I run is export dockerId='sixeyed'. The first version of the application uses a single container, running the Node.js application, and the data is only stored on the client’s browser. If you make some changes and refresh the browser, you’ll see your changes get lost. That’s because the events are only stored in memory on the client. In the next step you’ll fix that. Storing data in client memory is only good for proof-of-concept applications. In this step you’ll build and deploy version 2 of the app, which uses a SQL Server database to store the events. You’ll use Docker Compose to build and run the application. The compose file specifies the database and application containers to run, and how to configure them. You’ll see compose starts the database first, because it’s specified as a dependency for the application container. Then it starts the app container. If you list all containers, you’ll see there are two instances of the app container. One container started before the database was ready, so it failed - and then Docker Compose started a replacement container, which did connect to the database. You’ll see it’s the same user interface, but now you can add and delete events and when you refresh the page they’re still there. The data is persisted in SQL Server. The SQL Server database is not publicly available. In the docker-compose.yml file, the web container, the port 8080 is published so you can send traffic in, but no ports are published for the database. It’s only available to other containers and to Docker. Swarm mode lets you join several Docker servers together and treat them as a single unit. You deploy your app as services to the swarm, and Docker runs containers across all the servers. You can run multiple instances of a container to deal with scale, and if a server goes down and you lose containers, Docker starts replacement containers on other servers. This creates a single-node swarm. The output of the command shows you how to join other Docker servers to the swarm - all you need are more servers running Docker in the same network. You can scale Docker swarm up to hundreds of nodes. Version 3 has the same source code, but the Dockerfile for v3 of the the web app includes a HEALTHCHECK instruction. That tells Docker how to test if the application is healthy, and unhealthy containers are stopped and replaced with new ones. You’ll see the application behaviour is exactly the same - containers are running from the same Docker images, but now they’re being scheduled by Docker swarm. Docker swarm also supports rolling updates for applications running as stacks. In the next part you’ll add more functionality to the app, by running a web proxy. Node.js is a good server platform, but it’s easy to improve performance by putting a reverse proxy in front of the Node.js application. The proxy is the public entrypoint to the app, and it handles requests from users. Nginx is a popular open source web server which you can easily configure as a reverse proxy. The Nginx configuration in this part makes use of browser and server caching, which reduces the load on the web application and improves performance. The web application looks the same, but behind the scenes all the hard work is being done by the Nginx proxy. You can open developer tools on your browser and inspect the network responses - Nginx has added browser caching hints, and it’s also using a local cache to reduce traffic to the Node.js app. There are also several instances of the proxy container running - Docker swarm load-balances incoming requests between those containers. If you had multiple servers in the swarm, you would be able to scale up to handle your incoming workload. In the final part you’ll add monitoring to the application, so you can see what the Node.js container is doing. Docker swarm makes it super easy to scale containers, but before you go to production witrh a Dockerized application, you’ll want monitoring in place so you can see what all those containers are doing. Two open-source technologies are very popular in the Docker ecosystem for monitoring containers. 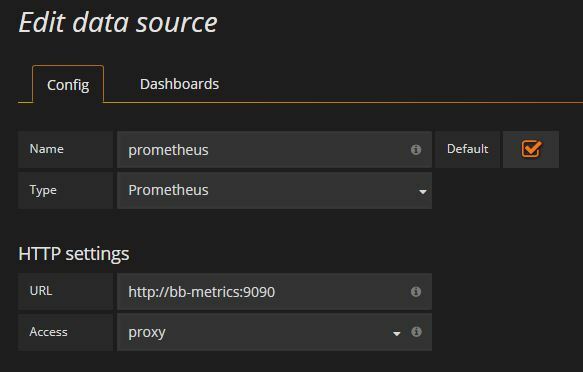 Prometheus is an instrumentation server that collects and stores metrics from your containers, and Grafana is an analytics UI that plugs into Prometheus to show dashboards. In this part you’ll add Prometheus and Grafana to your application. The UX is the same, but now the Prometheus container is scraping metrics from the Node.js container, every 5 seconds. Log in to Grafana with the credentials admin / admin. From the Grafana icon, click Dashboards… Import and load the JSON dashboard file from v5 /dashboard.json. Select the Prometheus data store. Thanks for completing the Node.js and SQL Server lab! You’ve learned how to build and run applications with Docker and Docker Compose, how to achieve high availability with Docker Swarm and how to get your application production ready by adding a proxy and a metrics dashboard. The Play with Docker Training site is always on, and there are plenty more labs you can try at home.